The composers whose music is featured on the present album lived and worked in Czechoslovakia between the two world wars, and their fates were afflicted by the monstrous Nazi regime. Viktor Ullmann, who before WWII held the post of Kapellmeister at the New German Theatre, wrote Quartet no.3 while he was detained at the Theresienstadt ghetto-camp. Hans Kr�sa completed the Theme and Variations in 1936, yet he only saw it performed in Theresienstadt, along with his children�s opera Brundib�r. Erwin Schulhoff�s Five Pieces reveal his zest for rhythm and dance, as well as his evidently having been inspired by the music of the Viennese salons, Italy and Spain. Pavel Haas�s Quartet no.2, dating from 1925, serves as vivid proof of the claim that the composer was the most gifted pupil of Leo� Jan�ček. In October 1944, Haas, Ullmann and Kr�sa were among the thousands of Theresienstadt prisoners transported to Auschwitz, where they would be murdered in the gas chambers. The Bennewitz Quartet launched their international career following their victories at the prestigious competition in Osaka (2005) and the Pr�mio Paolo Borciani in Italy (2008). Ever since they have regularly performed at the world�s most prominent venues (Wigmore Hall in London, Musikverein in Vienna, Konzerthaus in Berlin, Th��tre des Champs- Elys�es in Paris, concert halls in New York, Seoul, etc.) and festivals (Salzburger Festspiele, Lucerne Festival, Rheingau Musik Festival, etc.). Named after Anton�n Bennewitz, founder of the modern school of Czech string playing and mentor to the legendary Bohemian Quartet, the Bennewitz Quartet belong to the new generation of Czech chamber groups that have reinvigorated the Czech Republic�s musical profile in the years since the 1989 Velvet Revolution. They have already recorded quartets by Smetana and Dvoř�k, and an impressive disc of quintets with clarinettist Ludmila Peterkov�. Now they turn their attentions to the twentieth-century repertoire with a collection of works by Ullmann, Kr�sa, Schulhoff and Pavel Haas. The names will be familiar to many as representatives of that generation of musicians whose careers and lives were brutally snuffed out by the Nazis in the 1940s. Erwin Schulhoff, the eldest of the four and a free-thinking radical with communist sympathies, died of tuberculosis in W�lzburg concentration camp in August 1942. The other three died in the gas chambers of Auschwitz within 24 hours of one another, on 17/18 October 1944; before that, they had been part of the defiantly vibrant cultural life at Theresienstadt (Terez�n) concentration camp. 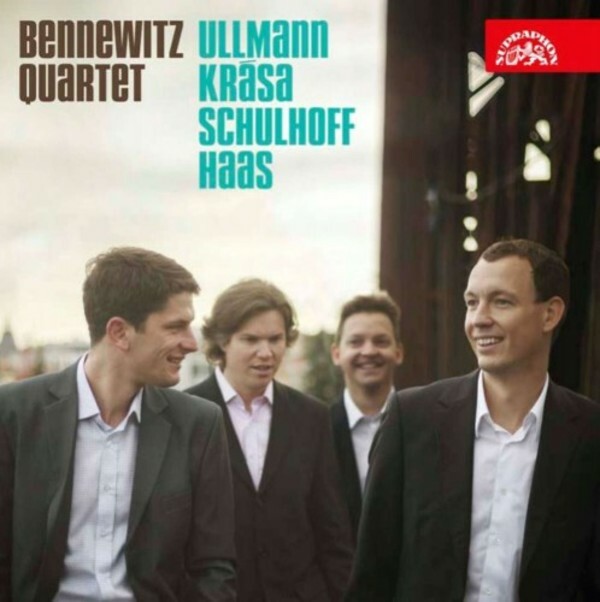 Thanks to the efforts of a number of musicians, musicologists and record companies over the past few decades, their music is gaining familiarity with domestic and international audiences, and this new disc from the Bennewitz Quartet is sure to raise their profile still further. It opens with Viktor Ullmann�s gloriously compact String Quartet no.3, composed at Theresienstadt in January 1943. Cast in a single movement in four distinct (and separately tracked) sections, it shows the influence of Ullmann�s mentor Schoenberg in its absorption of expressionist musical language. But it is the distinctiveness of each section, even within a brief timeframe (the longest is not much more than four minutes), that is most striking: the light spikiness of the scherzo section, the haunting lines of the Largo, the energy and eventual jubilation of the concluding Allegro vivace, but perhaps most of all the radiant tenderness of the opening Allegro moderato. It beggars belief that this music was composed in such harrowing circumstances, and the Bennewitz Quartet do it proud, in a performance of supreme technical artistry that never gets in the way of the music�s abundant character. Hans Kr�sa is best remembered today for his Dostoevsky-based opera Verlobung im Traum (1933). His Theme and Variations for String Quartet was composed in 1935/36, but was not premiered until 20 May 1944 in Theresienstadt. It is a wide-ranging work that starts in a mood of rapt innocence but soon takes on darker and even sardonic colourings, with a deft feeling for the timbral possibilities of the string quartet genre. Once again, the Bennewitz Quartet turn in a superb performance of a miniature masterpiece, the only performance currently in the catalogue. Schulhoff�s Five Pieces for String Quartet is one of the best-known works on the disc, its movements based on popular dance forms, four of which made a huge impression at the Salzburg ISCM Festival in 1924. Dedicated to Darius Milhaud, it is a wry celebration of contemporary dance forms, including a Viennese waltz, a Mediterranean-infused Serenade, a lively Czech dance, a sensually inflected Tango milonga, and a bracing concluding Tarantella. This is certainly one of the best performances now on disc, lively, characterful, brilliantly rhythmic and immaculately toned, with a real vibrancy throughout. The ironic twists and turn are unerringly captured without loss of good humour. Finally there is Haas�s Second String Quartet (1925), subtitled �From the Monkey Mountains�, which at one level is a series of four tone pictures inspired by the Bohemian-Moravian Highlands. This is music of utter genius, including a mysterious opening Landscape (complete with birdsong), a tipsy ride with a Coach, Coachman and Horse, a hauntingly dreamy The Moon and I, and an at times rowdy concluding Wild Night, complete with percussion (played here by Pavel Rehberger). This is another benchmark recording in a highly competitive field. In the pacey performance of the closing movement, the percussion here provides rhythmic support, reinforcing the rhythmic character of the quartet�s music rather than dominating proceedings, and is much the better for it. Recording quality from Supraphon and documentation are all first-class, and as a musical tribute to a senselessly lost generation of Czech composers this can hardly be bettered. With top-quality playing throughout, even those with most of these works already in their collections will want to snap this disc up. They will find it endlessly rewarding.